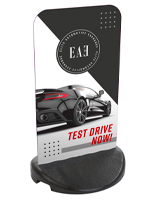 The LED Display Sign for Sale Here Holds 8-1/2" x 11" Signage! 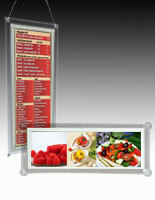 Browse a Huge Selection of Illuminating Poster Systems! Each LED Display Sign Brightly Illuminates Advertisements! LED backlighting is bright, energy efficient and environmentally-friendly. 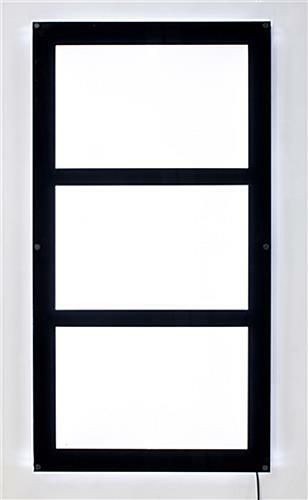 Black standoff hardware and wall mounting kit for displaying in landscape or portrait format. 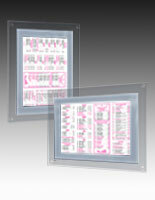 1/4" Thick clear acrylic panel with 1/8" thick acrylic overlay has a slim profile. Illuminated edges and black border draw viewers' attention to the posters on display. Designed to illuminate (3) 8-1/2" x 11" posters. 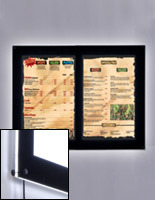 This three-panel LED sign is a new and unique alterative for displaying 8-1/2" x 11" advertisements or menus! There are three spaces for exhibiting 8-1/2" x 11" advertisements on this unit. The viewable area of each poster in the LED sign that mounts to the wall is 8"w x 10-1/2"h. Bright backlighting illuminates each poster, which creates an eye-catching effect! 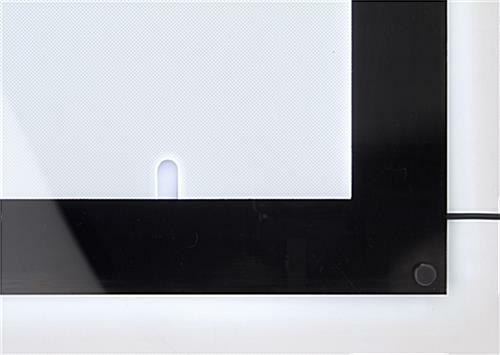 This LED display sign, also known as a poster panel, features a propriety light diffusion pattern so illumination is diffused evenly across each poster. The result of this effect is illuminated signage with no shadows or hot and cold spots. 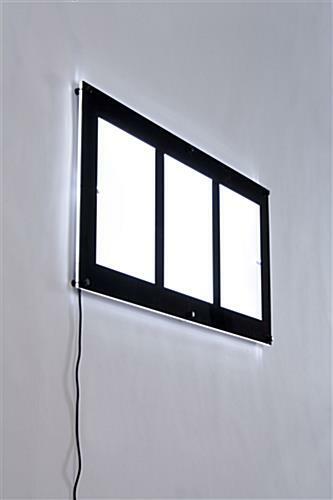 Sleek black standoff hardware is included with the purchase of this LED display sign. Screws and anchors also come with the unit. The standoffs have a 1/2" diameter, providing a subtle accent. This signage panel, LED display sign that has black standoff hardware, looks far more stylish than an illuminated poster frame mounted to the wall with only screws. This LED display sign that is backlit will differentiate an establishment from competitors. The combination of bright illumination, sleek black mounting standoffs and black border forms a very contemporary-looking display, ideal for businesses trying to portray a cutting-edge image. This LED display sign with a black border is not only stylish, but also has a number of user-friendly features incorporated in its design. The back panel has notches to facilitate quick changing of graphics. 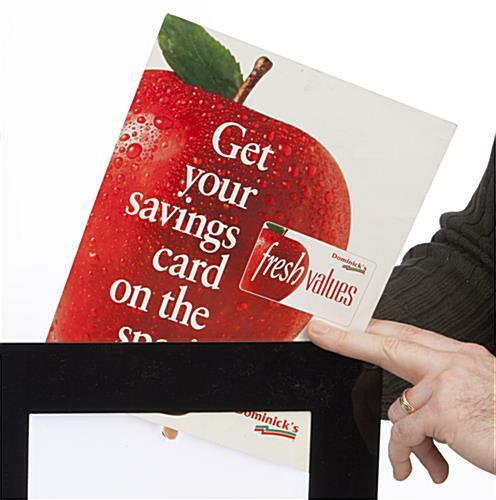 Users can slide posters in and out of the acrylic panel without fully removing the front lens. 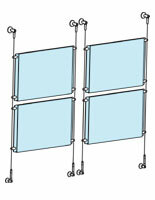 Optional end caps for the standoff hardware are included if users decide to hang this light panel from the ceiling with a cable system. Electronic light boxes are well worth the investment because they pay huge dividends in the form of increased customer exposure! As an added bonus, this electronic light panel uses less electricity than florescent light boxes, so this signage panel pays for itself over time! Please Note: The LED backlighting is maximized when posters are printed on a translucent material. 31.0" x 14.5" x 1.3"